A very special thanks to all those groups who have supported us with their own fundraisers over the year! Thanks to those who joined us to celebrate a German Christmas Market, a German tradition, on December 4, 2016 here on the Main Line. Donations from the event will go to T&E Care. Special thanks to Helena Malarkey for coordinating this shopping event. And VERY special thanks to SAP for matching the donation! What a special treat! 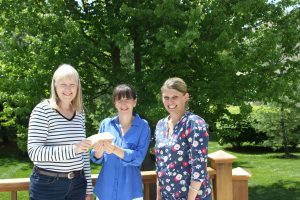 Every year the local Fox & Roach Charity office decides which local charities to support, and again this year T&E Care was selected as one of their recipients. 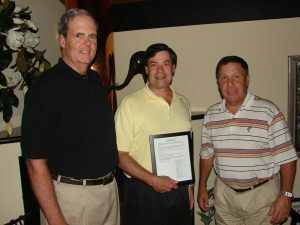 We’ve been a recipient of this grant for a number of years, and we VERY much appreciate this recognition. T&E Care volunteers joined the Paoli Business and Professional Association and the Paoli Hardware Center to welcome Santa to Paoli on December 3, 2016. He was escorted to town by the Paoli Fire Company! All in attendance enjoyed entertainment, refreshments, and lots of fun. All donations benefitted T&E Care. Thanks to the PBPA for this wonderful support! The Annual Alternative Gift Market – a success! Thanks again to the Baptist Church in the Great Valley and the United Church of Christ for co-hosting the 5th annual Alternative Gift Market on November 12 and 13, 2016. This was a great opportunity to find some unique and fun holiday gifts for family and friends and do “holiday shopping that helps others”. Once all tabulated, proceeds from the event will be donated T&E Care. We VERY much appreciate this support! Turkey Burn for T&E Care – a huge success! Again this year the Blue Sky Band and Deck 5 Band played a concert at 30 Main in Berwyn to benefit T&E Care. Entrance fee was a gift card for the big Holiday Drive. Over $1000 in gift cards and general donations was raised with this effort! Special thanks to all those who attended, to the bands for taking the time to perform (at no cost to T&E Care!). Very special thanks as well to 30 Main for giving us a percentage of the revenue from food/drinks sold that night. We received a check for $500 through this event! WOW is all we can say! The Shandtract Civic Association recently donated a portion of the proceeds from their Tyler Hedges Day event held earlier in October 2016. This event is held in memory of a young neighbor who lost his battle with leukemia, for the purpose of bringing the neighborhood together and raising money for local charities in his name. The funds received from this amazing event are used to support our camp assistance program. Last year over 80 local kids went to camp, in part with the assistance of this program – so they are really touching a lot of lives! THANKS! 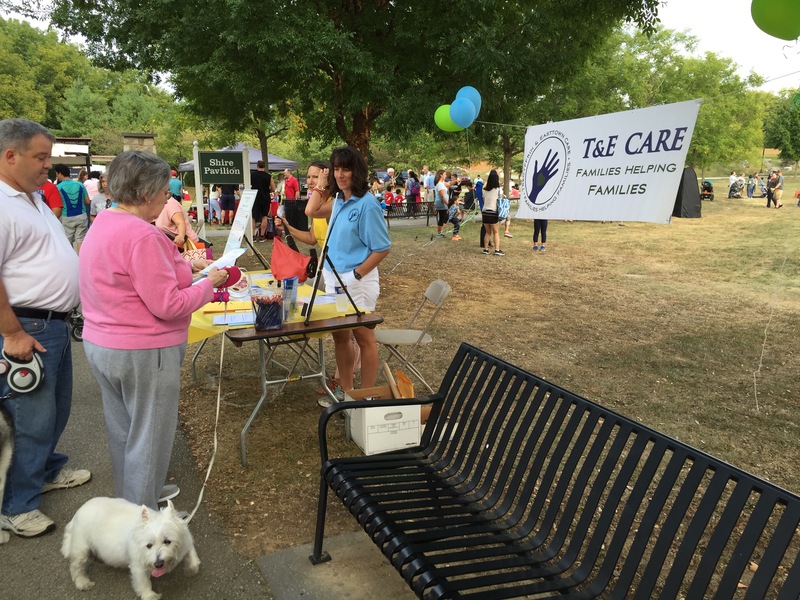 Thanks to the T&E Care volunteers who worked a shift at the September 2017 Tredyffrin Township Birthday Celebration! 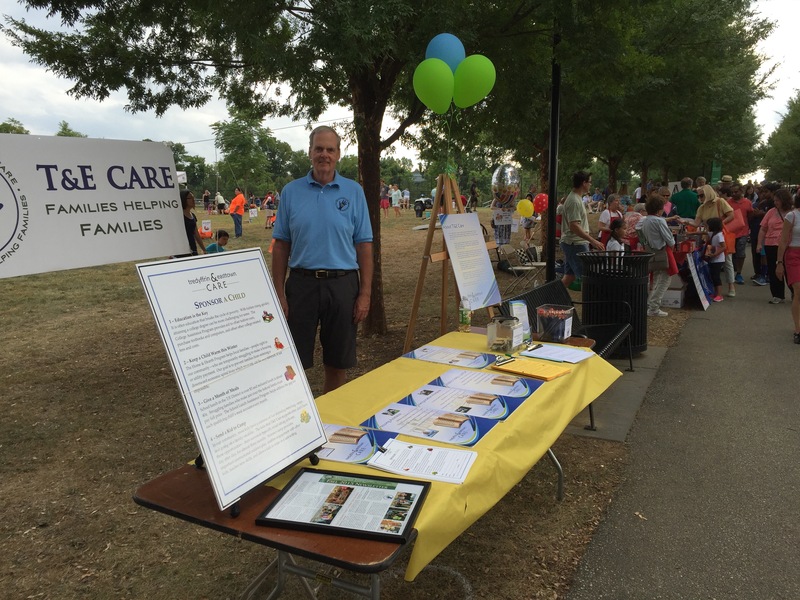 We loved visiting with the many folks who stopped by our table to learn more about our organization. Thanks to all who made donations in support of our programs. Thanks again to Jennifer on the Avenue for hosting a special event for T&E Care on Monday, October 24, 2016. We appreciate their continued support of our mission! As part of the community celebrations this year – Paoli Village Shoppes celebrated its 50th anniversary this fall. They hosted assorted events throughout the fall, culminating with the Paoli Blues Fest on October 1. All the money raised during this time was presented to T&E Care in early October. Additionally the PVS collected 50 bags of assorted supplies to be given to local families, including $25 coupons to many of the stores within the PVS. Thanks thanks thanks to PVS for considering this partnership and helping in our efforts to lend assistance to local families. the Berwyn Devon Business & Professional Association event, Mayfest. This fun event is a great chance for the community neighbors to get to know various local businesses and organizations. Thanks to all who stopped by our table on this dreary day to say hi! $1000 was raised by the event for T&E Care!!! Thanks again to Whole Foods (Devon) for supporting T&E Care in their Nickels for Non-Profits Program from January 18-April 10, 2016. This program allowed customers to donate their 5¢ bag refund to T&E Care instead of receiving it themselves. We recently learned that over $500 was raised through this program! That’s a lot of nickels! Thanks to all who shopped at Whole Foods and named T&E Care at the registers. 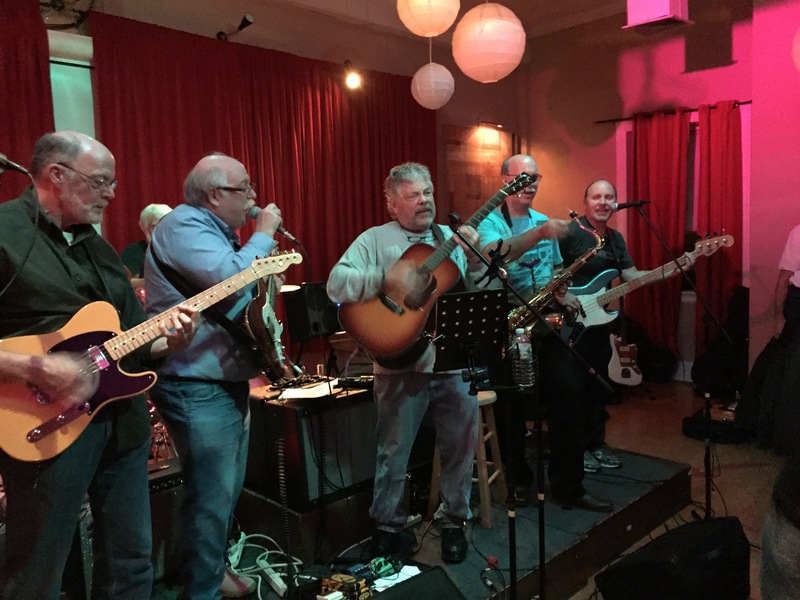 30 Main, a great restaurant in downtown Berwyn, hosted again this year the Blue Sky Band as well as a new band, Deck 5, on Saturday, December 5, 2015. Those attending brought gift cards to be used for the Holiday Drive. Over $1800 in gift card value was donated – which is FANTASTIC!!! We still have to hear from 30 Main who will be donating 10% of the dinner costs for those also coming to the event. Exciting night for sure. The bands are described below, as well as some fun pictures. We are hopeful that this will become a yearly tradition. These bands plays classic rock music for fundraising events for charitable causes in the Greater Philadelphia area. Blue Sky is comprised of seven professionals from the area who started playing together in 2000. Dave Long sings and plays lead guitar and harmonica. Away from rock n’ roll Dave is a neurologist and director of the Brain Injury Unit at the Bryn Mawr Rehabilitation Hospital. John Spangenberg sings lead vocals and plays rhythm guitar. 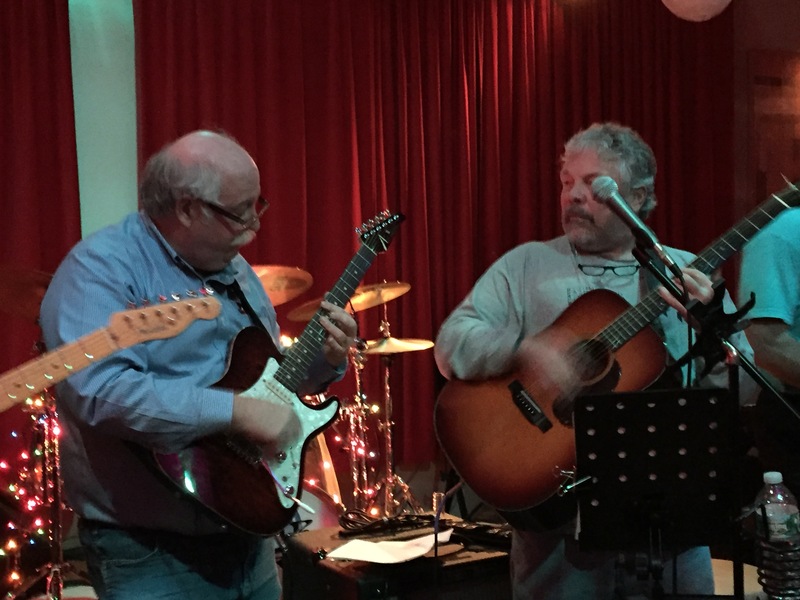 He is a physical therapist and owner of Physical Therapy Workshop located in Coatesville, Pa. John Bergh joins Dave Long on lead guitar, and also sings. He is the Chief Engineer for Ingersoll Rand Industrial Technologies in West Chester, Pa. Dave Glarner sings and is the keyboardist for the band. Dave has been a community banker in Chester County for over 40 years and currently serves as a Senior Vice President for Bryn Mawr Trust Company. Dan Wheeler sings and plays bass guitar. He has been a Program Host for the QVC Network in West Chester for over 20 years. Joe Cafarcio plays the saxophone and is an Executive Vice President for Meridian Bank in Devon, Pa. Todd Pohlig plays the drums. Todd and his brother are the founders of Pohlig Builders, building along the Main Line for the last 40 years. Deck 5 started playing together in the Main Line School of Rock. Michael Roche sings lead, and plays guitar & harmonica; he teaches Drama at the William Penn Charter School. Gregg Trexler sings, plays bass & keys; he is a CAD Group Leader, Mechanical Design for Clyde Bergemann Power Group in Malvern. Ed Szymanski plays bass & drums; he is a field operation supervisor for Comcast in Sellersville. Rusty Rahmer plays guitar and sings; he is a Head of Enterprise Digital Analytics for the Vanguard Group in Malvern. Fred Lara plays guitar and sings; he is a partner in Health Care Apprasiers Inc. in Wayne. Maggie Riley sings and is head of Internal Communication for Wegmans. Ryan Pohlig plays drums and sings; he is the Sr. Biostatistician for the College of Health Sciences at the University of Delaware. Jennifer On The Avenue (Berwyn) once again supported T&E Cae with a shopping day on Monday, December 7, 2015. Jennifer donated 10% of sales that day to T&E Care. We appreciate everyone who took this opportunity to get some great gifts – including clothing, accessories, and many stocking stuffers. Thanks again to Jennifer On The Avenue for it’s continued support of T&E Care! Again this year Mojo Fitness did a Thanksgiving Turkey Burn as a fundraiser for the T&E Care Holiday Drive. It was a HUGE success! Reports are that lots of folks came, and lots of pounds were shed! The cost was $10/person and all ages and levels of fitness were welcome! The event was held in the Delaware Valley Friends School gym, on East Central Rd, in Paoli. MANY MANY thanks to Cindy Brauer for organizing this exciting event! Mojo Fitness combines great music with fun fitness-focused moves to get a total body workout. 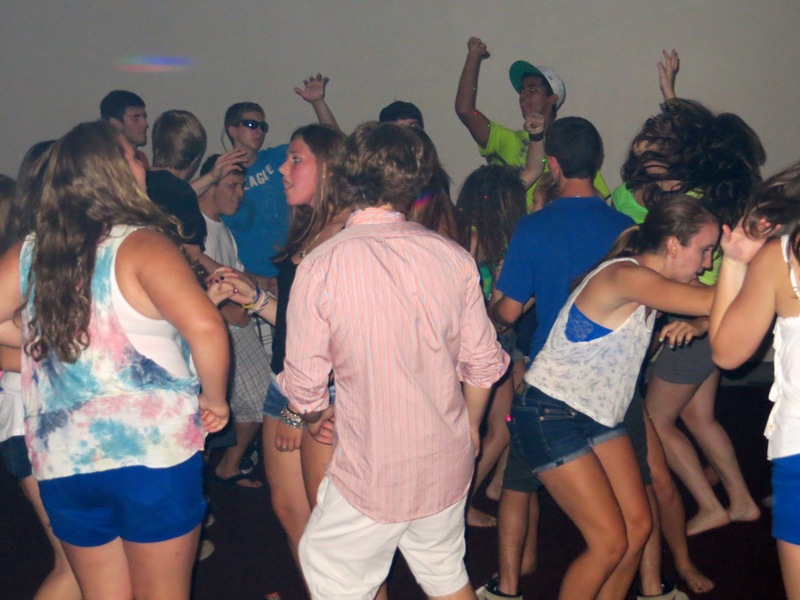 As a result, every Mojo experience is more like a dance club experience than a dance class. For more details, go to mojofitness.biz. Were you looking for alternatives to mall-shopping this holiday season? Wondering what to give Uncle Bob instead of one more necktie? Want your purchases to make a difference in the world? Hopefully on November 14 or 15 you went to the Alternative Gift Market, where you could find unique hand-made and fair-trade gifts for everyone on your list, and your purchases will help people in need, both locally and around the world! This 4th annual Alternative Gift Market was co-organized by two churches (United Church of Christ at Valley Forge and Baptist Church in the Great Valley). We appreciate their ongoing support! Every month the Main Line Unitarian Church in Devon shares 1/2 its collection plate with an organization. In October 2015 T&E Care was the recipient of those collections. We are honored to say that we recently received this donation – and wow – what a great effort on their part! 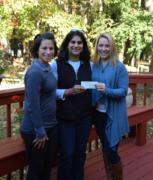 Over $2000 was given to us to help with our mission of working with local families. Morgan McLean, associate pastor at MLUC presented the check to T&E Care representatives at the recent T&E Care Holiday Drive sorting day. Accepting the check were Karen Ridder, Allyson Hotz, Sandi Gorman, Jo Howarth, and Lisa Christy. 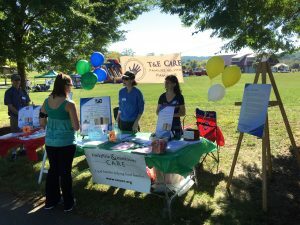 T&E Care was pleased to be part of the annual Tredyffrin Day – held at Wilson Farm Park. We thank all those who stopped by and visited with our volunteers, and especially to those who made donations. And Help Local College Students – What a huge success! When a student heads to college – he can get scholarships, grants, and loans to cover the costs of tuition, room, and board. But those books – wow are they expensive! It can be so hard to get the funds to cover them. We’ve actually worked with kids who dropped out of school because they couldn’t afford the books! On Aug 7, 2015, the Devon branch of TD Bank ran a one-day fundraiser to help us cover the costs of the books for a number of the students we support. Everyone was encouraged to gather up all lose change and take it to the branch and have it counted at the Penny Arcade. TD Bank matched up to $2000 all the change it counts that day. (There was a little confusion about this aspect of the program – but all change counts WERE counted, whether you donated or not – we did confirm this!) We are excited to say that, in any case, over $2000 was counted – so we got the full amount from TD Bank – PLUS a number of folks just let T&E Care keep the change. That total is not in yet – but we should have well over $1500 in additional donations. That’s a LOT of loose change! Think how much lighter our purses and pockets will be – our back doctors will be happy with this fund raiser! Thanks to all who stopped by and contributed to this cause. A lot of our local college kids will be fortunate because of your participation! Go to http://www.tdbringchange.com/state/pennsylvania/5302/ for more details. May 17, 2015 was a great day in Berwyn! The Wellness Festival drew over a thousand folks with lots of great kids games and activities. Starting at the corner of Old Lancaster Rd. and Rt. 30 in Berwyn (across from Handel’s Ice Cream) and up Old Lancaster to the Bagel Factory you could see the excitement with rock climbing, Zumba, hula hoops, a scavenger hunt, a moon bounce and lots of other fun and healthy activities and of course, great food! Thanks to Jump Dautrich, Laura Bartholomew, and Kirk Gorman for taking the time to man the booth for T&E Care! We hope you stopped by. T&E Care, Damieon Counseling Center, The Berwyn Veteran’s Association, and the TE Children’s Dental Clinic are all recipients of any money raised during the event, presented by the Berwyn Devon Business & Professional Association. We are proud to be part of this important group of non-profits in our community! 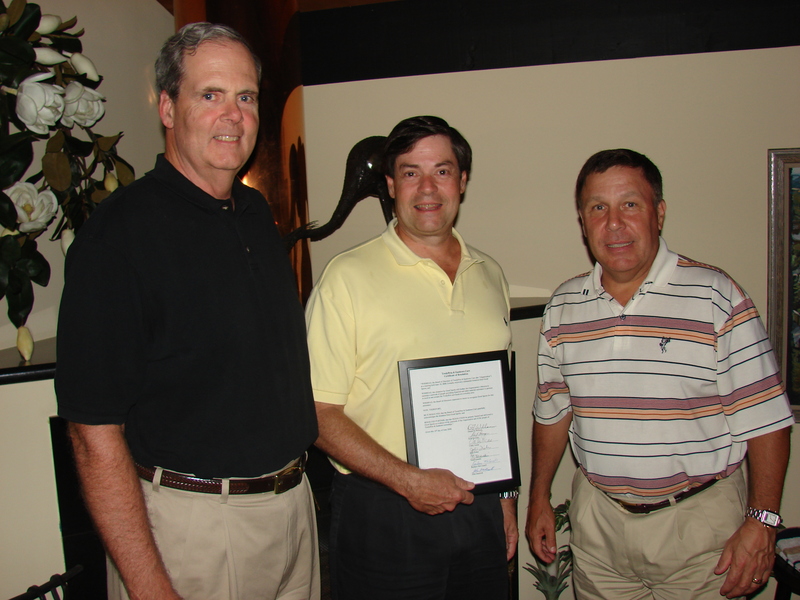 The check presentations were made at the annual BDBPA dinner held on June 10, 2015. Congratulations to our own Bernie Logan for being named Citizen of the Year by the BDBPA, as a result of her work with the Children’s Dental Clinic. We’re very proud of Bernie! 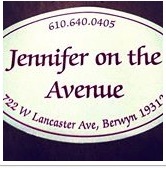 Jennifer on the Avenue is a fabulous and affordable New York style boutique right in Berwyn! 10% of sales throughout the day on April 27, 2015 were donated to T&E Care. Thanks for any who went to the store to do some shopping on Monday! The event was hosted by Alix Mayock and Jennifer West. From October 1, 2014 through January 18, 2015, T&E Care was one of the non-profits recognized by the Devon Whole Foods for their Nickels for Non-Profits Program. This program allows customers to donate their 5¢ bag refund to local nonprofit organizations instead of receiving it themselves. Many thanks to Whole Foods for selecting us for this program! 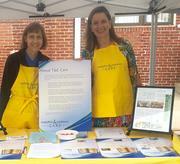 And thanks to Rachel Weger and Kathryn Santavasci for being our greeters on Saturday, November 23. They did a great job! 30 Main, a restaurant in Berwyn, hosted the Blue Sky Band on Friday, December 5, 2014. Below is a description of this amazing band. Gift cards for the T&E Care Holiday Drive were the admission fee. Over $1300 in gift cards was received from this event, and we’ve yet to hear from 30 Main for their donation (10% of dinner bills). Everyone in attendance had a great time!! Many thanks to the Blue Sky Band for organizing this special event, and to 30 Main for hosting!! The Blue Sky Band plays classic rock music for fundraising events for charitable causes in the Greater Philadelphia area. They perform pro bono, playing covers from a wide variety of artists from the 60’s to the present including the Allman Brothers, Rolling Stones, Eric Clapton, Lynyrd Skynyrd, Van Morrison and others. Since 2004, Blue Sky has raised, or assisted non-profits in raising in excess of $250,000 for organizations such as the American Cancer Society, Safe Harbor, Community Volunteers in Medicine, The Bryn Mawr Rehab Brain Injury Unit Expansion Program, The Chester County Pops Orchestra, MANNA, The Twin Peaks Foundation, Laps for Lexie, and many individuals in need of help due to medical issues. The band donates its services to Non-Profit Agencies for their fundraising events, or allows the band to be put up for auction at various organizations’ fundraisers. Blue Sky is comprised of seven professionals from the area. Dave Long sings and plays lead guitar and harmonica. Away from rock n’ roll Dave is a neurologist and director of the Brain Injury Unit at the Bryn Mawr Rehabilitation Hospital. John Spangenberg sings lead vocals and plays rhythm guitar. 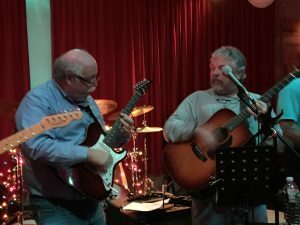 He is a physical therapist and owner of Physical Therapy Workshop located in Coatesville, Pa. John Bergh joins Dave Long on lead guitar, and also sings. He is the Chief Engineer for Ingersoll Rand Industrial Technologies in West Chester, Pa. Todd Pohlig keeps the Blue Sky beat on drums. Todd is one of the principals of Pohlig Builders, based in Malvern, Pa. Dave Glarner sings and is the keyboardist for the band. Dave has been a community banker in Chester County for over 40 years and currently serves as a Senior Vice President for Bryn Mawr Trust Company. Dan Wheeler sings and plays bass guitar for Blue Sky and has been a Program Host for the QVC Network in West Chester for over 20 years. Finally, Joe Cafarcio fills in the Blue Sky sound on the saxophone. Joe is an Executive Vice President for Meridian Bank in Devon, Pa. 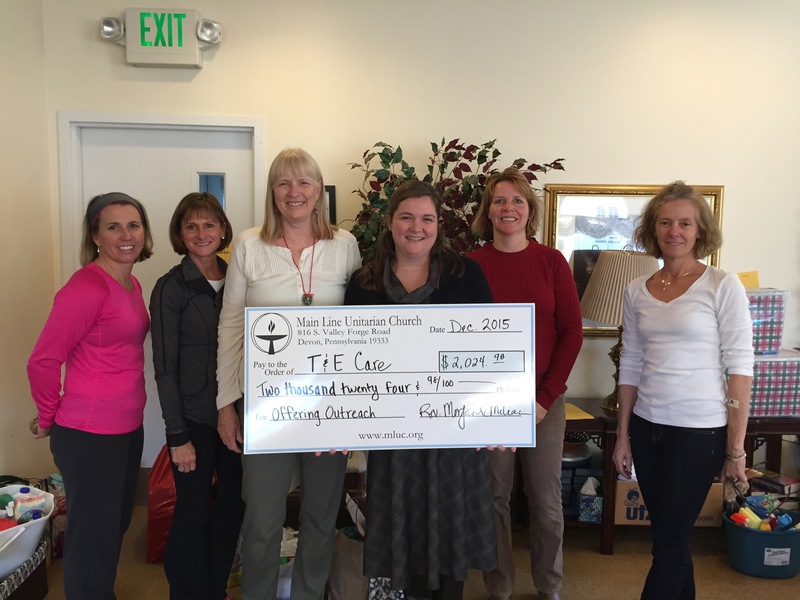 Many thanks to the United Church of Christ at Valley Forge and the Baptist Church in the Great Valley for hosting a special shopping day on November 15 and 16, 2014, with the proceeds to support T&E Care. We hope those who attended got some great gifts for the holidays or for other purposes. Mojo Fitness is a music infused total-body workout program with classes in Wayne and Paoli. 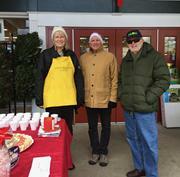 On November 29, 2014, they hosted their third annual Turkey Burn with all proceeds benefitting T&E Care. Over $800 was raised, which means there are a lot of healthy folks in TE!! For more details, visit www.mojofitness.biz or e-mail cindy@mojofitness.biz. 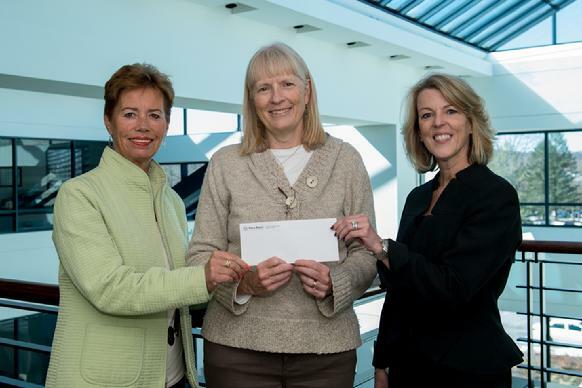 Much appreciation to the Society of Professional Women and Eileen Connolly-Robbins for allowing us to be the recognized charity at a luncheon in September, 2014. This was a huge tribute and we were very honored to be included in this. A special thanks to Wells Fargo Bank for their $1000 donation as the result of this event. Jennifer on the Avenue hosted it’s 2nd Shopping Day for T&E Care on November 3, 2014. 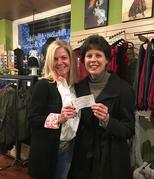 10% of the proceeds were donated to T&E Care. Thanks very much to Jennifer on the Avenue (Berwyn) and to Alix Mayock and Jennifer West for hosting this special event. WELLNESS FESTIVAL 2014 – lots of fun! The Berwyn Devon Business & Professional Association, in conjunction with Bryn Mawr Trust, held its 2n d Annual Wellness Festival on May 18, 2014. There were lots of fun activities, food, and booths by local businesses. Activities for adults and kids included: rock climbing, a moon bounce, a zip line, a scavenger hunt, hula hoops, and zumba. Many folks enjoyed this special event, and he proceeds will be divided among Daemion Counseling Center, the T/E Dental Clinic, The Berwyn Vets, and T&E Care. 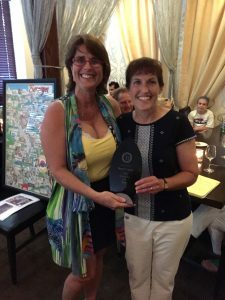 They also recognized Sandi Gorman as the Citizen of the Year. This is actually a recognition for T&E Care in general – what a great organization!! Thanks for any support you offered and we hope you had fun! New Eagle Fun Run 2014 a huge success! 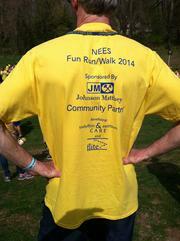 Thanks to NEES students and families for participating in the recent Fun Run, April 25, 2014! Over 300 students ran the one mile course to raise money for T&E Care and FLITE. The weather cooperated to make this event, sponsored by Johnson Matthey, a huge success. We really appreciate the support of so many NEES families! THANKS for the great soup lessons! On Sunday, February 9, 2014, Art Roman of The Kitchen Workshop (Paoli) ran a Soup Cooking Class for a group of community members participants, with 100% of the proceeds going to T&E Care. Art donated the food and his time! What a great community partner he’s been over the years. If you ever want to take cooking classes – check out his place! Recipes he cooked included: Thai Shrimp Soup (with Lemon and Jalapenos), Tuscan Ribollita (a hearty stick-to-your-ribs vegetable soup), Beef Barley Soup (with mushrooms), and Art’s Bavarian Split Pea and Ham Soup (with Gruyere and rye crutons). One participant sent this note after the event: A couple of my friends joined me yesterday at the Kitchen Workshop fundraiser and I just had to say “thank you” for passing that email along. We had such a good time. I hate cooking but yet had a great time with the ladies that were there and with Art. He’s great and of course his sense of humor made cooking so much more enjoyable. I would do that again in a heartbeat and would recommend a class to anyone – especially those like me. Thanks to Polka Dots (Paoli) for offering a shopping day for T&E Care on May 2, 2013. We thank all those who went shopping for us! Your support and the help of Polka Dots is MUCH appreciated! Thanks for the support – 2013! Many thanks to the Newcomers of Great Valley for their recent support of T&E Care with a charity fundraiser. 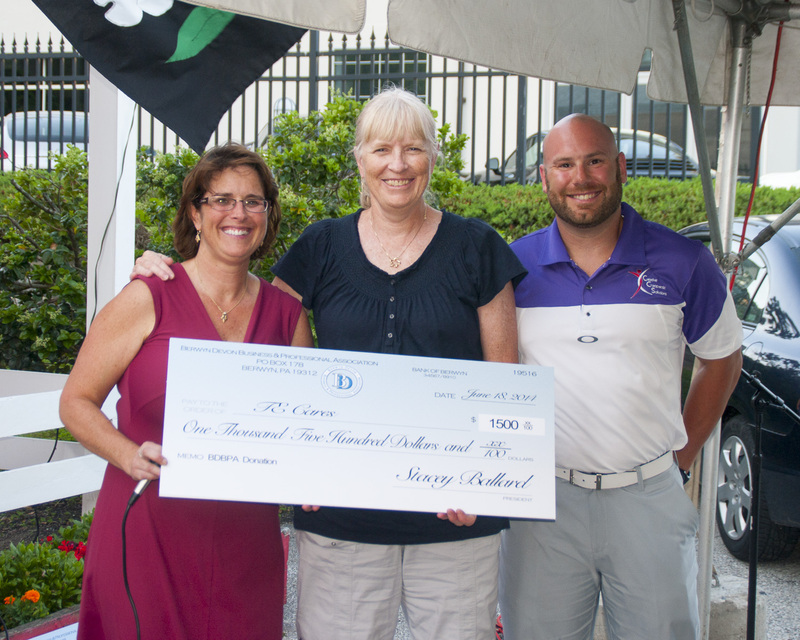 Pictured is Karen Bossan presenting the check to T&E Care President, Sandi Gorman. Karen organized the event for the Newcomers club. Current president of Newcomers is Sarah Culbert. It’s so great to have partners like this in our efforts to support local families! *The funds for T&E Care help to support our summer camp assistance program and are MUCH appreciated! Thanks to The Kitchen Workshop! On Saturday evening, Feb 18, 2012 Art Roman of The Kitchen Workshop (Paoli) held a special evening class with all the proceeds being donated to T&E Care! The 3 hour cooking class included lots of soups and breads for a wonderful treat! 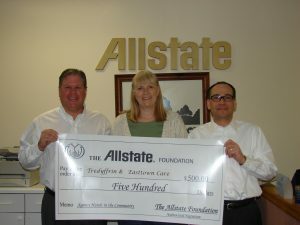 Many thanks to Art for once again being a huge community supporter of T&E Care! The Tyler Hedges Day 5K Race/Walk was started in memory of a young neighbor who died of leukemia for the purposes of bringing the neighborhood together and raising money for local charities in his name. The proceeds of this year’s event will be donated to NTAF Mid-Atlantic Traumatic Brain Injury Fund (in honor of Logan Schweiter), Tredyffrin Library, and T&E Care. We will put any funds donated to T&E Care for our summer camp program. Tyler Hedges Day 5K Race/Walk 2010 – another big success. Many of you may remember Tyler Hedges, a young boy from our community who died of leukemia a few years ago. The 13th Annual Tyler Hedges Day 5K Race/Walk was held in his memory on Saturday, October 2, 2010. Again this year all proceeds from this race were donated to the Tredyffrin Library AND T&E Care! The race was very successful and again the funds raised will help support our summer camp initiative. Many thanks to all who sponsored the race and to those who participated in it! We are honored to be remembered along with Tyler! Many thanks to the TEEA for its great support of FLITE and T&E Care with a recent walk around Wilson Park! 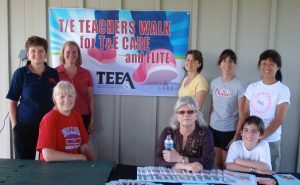 Many district teachers came out to help with this great event – all for a great cause. November 2009 – Many many thanks to the Main Line Unitarian Church members for giving 1/2 their November collections to T&E Care. These funds will be used to help with upcoming utility bill payments – something we know will be hard for families during the cold winter months. 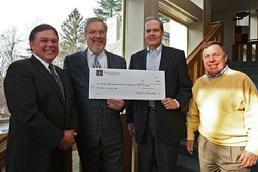 The donation was presented to T&E Care Board members Kirk Gorman and Denny Willson by Rev. Dr. Justin Osterman and Craig Roshaven. Tyler Hedges Day 2009 – 5K Race/Walk a huge success. Many of you may remember Tyler Hedges, a young boy from our community who died of leukemia a few years ago. The 12th Annual Tyler Hedges Day 5K Race/Walk was held in his memory on Saturday, October 10, 2009. 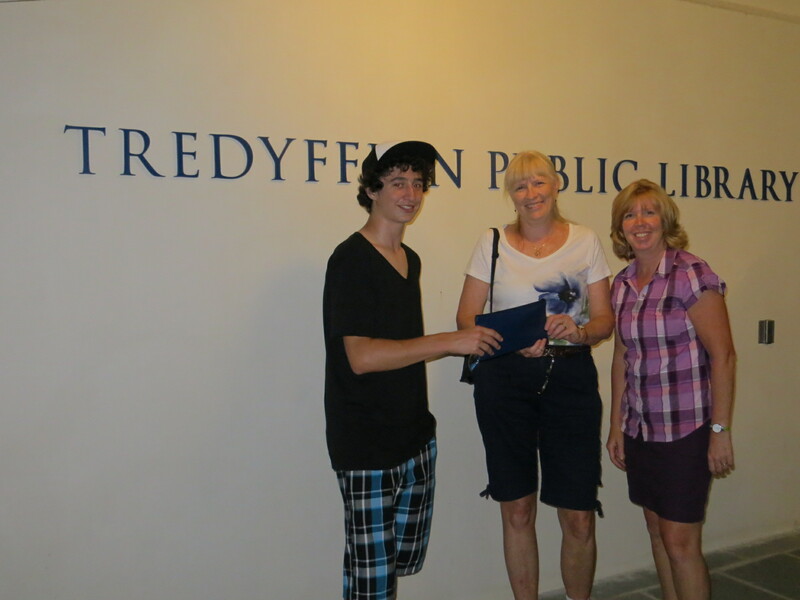 This year all proceeds from this race were donated to the Tredyffrin Library AND T&E Care! We just learned that over $2500 will be given to each organization. This is terrific news. They have requested that it go to a fund to help with summer camp expenses for local kids needing assistance. Many thanks to all who sponsored the race and to those who participated in it! We are honored to be remembered along with Tyler! One of our younger community members recently decided to host a lemonade stand in her neighborhood. 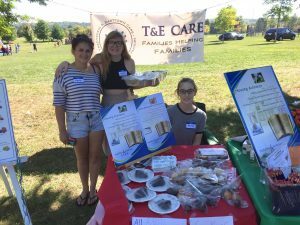 When Anna Fuscaldo asked her mom what they could do with the money they raised, her mom suggested putting it toward the School Meal Assistance Program run by T&E Care. Anna agreed that was a great idea. Many thanks to Anna’s entrepreneurial energies – she raised $127! Her efforts will help 6 local kids get help for a month of school lunches! Great job Anna! Over 12 people had the chance to enjoy appetizers and dinner at The Kitchen Workshop in Paoli – learning to cook these foods as well as eating them! 100% of the costs of this class were donated to the local food pantry REACT. Thanks to those people who came to this event, and to Art Roman of The Kitchen Workshop for donating all the funds to this important program. Please visit The Kitchen Workshop’s web-site at www.kitchen-workshop.com for upcoming classes, summer cooking camps for kids, corporate team-building opportunities and the offerings of children’s birthday parties. 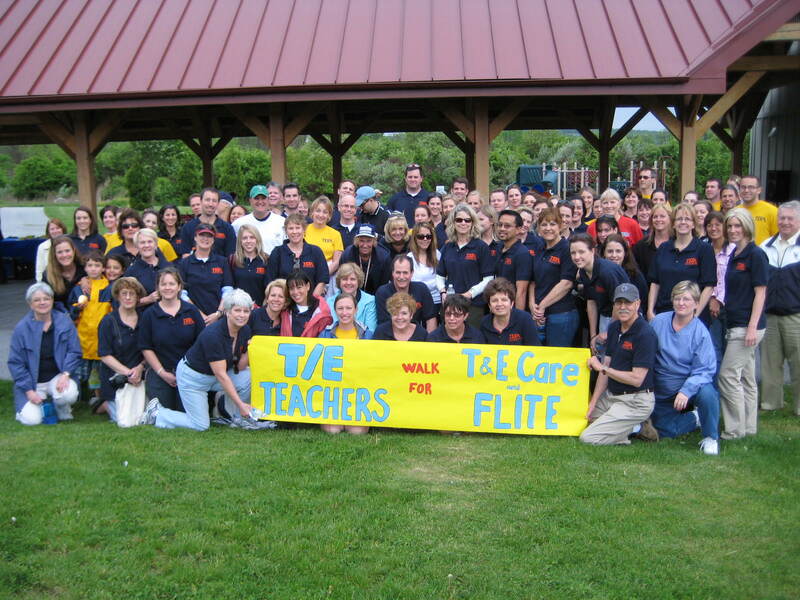 On Thursday, June 14, 2009, many Tredyffrin/Easttown School District staff members met at Wilson Park to walk 3 miles for T&E Care and FLITE (the Foundation for Learning In Tredyffrin/Easttown). 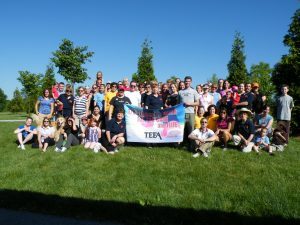 We are honored that the local teacher’s union (Tredyffrin Easttown Education Association – TEEA) decided to host this walk for these two organizations. 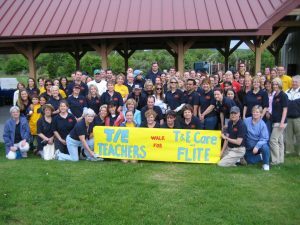 Both T&E Care and FLITE work with students and families in the district, coordinating much of this through the school district. Many thanks to the great staff of the TESD for their efforts in planning this special event. Des pite the dark cloud and drizzle on the day of the event, much fun was had by all who participated. And $3500 was raised by the participants for EACH of the two groups! What a HUGE help that will be for both FLITE and T&E Care. 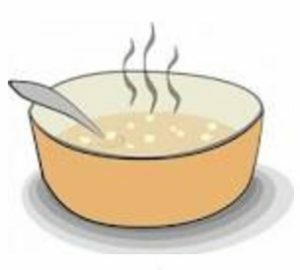 Many thanks to those who came out and learned to cook broccoli/potato/cheese soup under the capable direction of Art Roman (The Kitchen Workshop in Paoli), and then got to eat the soup in the delicious bread bowls donated by Panera Bread in Gateway Shopping Center. Lots of food was also collected for the local food pantry as well. 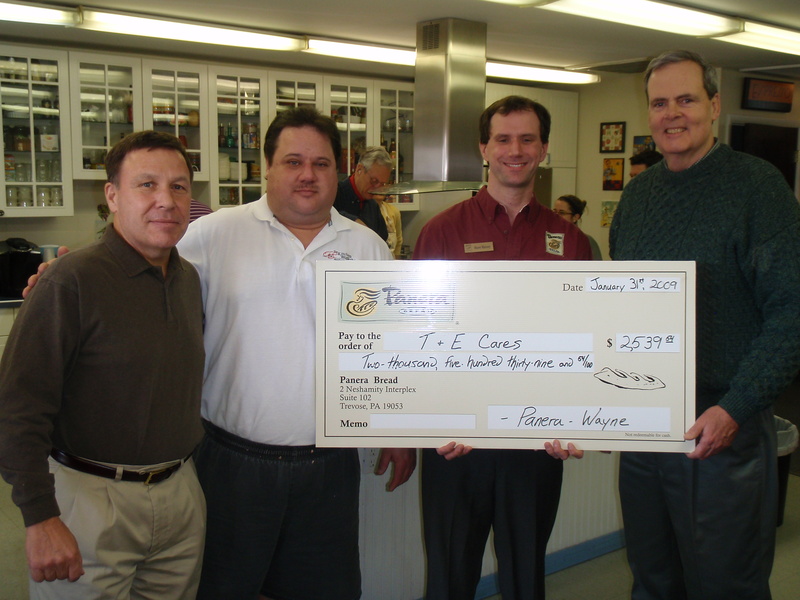 The highlight of the event was the presentation to T&E Care of a check from Panera Bread for $2539.54! 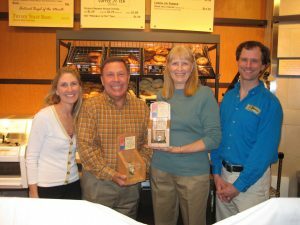 This donation from Panera came from the collection boxes at the check-out stations at the Gateway Panera Bread, with collections being gathered since their opening in April, 2008. Panera also matched the donations with an additonal 25¢ for each $1 donated. MANY thanks to Panera for the bread bowls and this donation, to Art Roman for donating the supplies and his kitchen for the soup, and to all those who came to make the event a success! In the summer of 2012, Matt Holzer, a CHS student, decided to make a difference by raising money for T&E Care. He likes to do DJ work on the side, so he organized a dance to be held at the Tredyffrin Library, invited a ton of friends, and the rest is history! What an amazing young man to be able to pull something like this off. Thanks Matt! For the 3rd year T&E Care ran the gift wrap table at the Devon Barnes and Noble. We were there on Saturday, December 13, 2008, from 9am-11pm. Thank you to the many many people who offered to help out and to those who stopped by to say hi! Many thanks especially to Julia Fisher for organizing this successful event. Thanks to Play It Again Sports for making a donation to T&E Care in payment for the sporting goods items collected during the recent drive held in May 2008. Many items were dropped off and the store will have a great opening sometime this summer. Play It Again Sports is the premier store for quality new and used sporting goods and fitness equipment. It is located at 1004 Lancaster Ave in Berwyn. Polka Dots, a specialty clothing store located near the Acme in the Paoli Shopping Center, had a weeklong celebration from May 12-16 to help benefit the community, and specifically T&E Care. Many many thanks to the Polka Dots staff for organizing this terrific event, and to all those who stopped into the store! We REALLY appreciate your support!!!!!!! 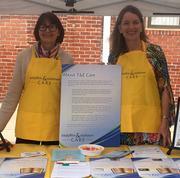 On Saturday, April 12 the TE North MOMS Club hosted a “Shop in Paoli Day” to raise funds for T&E Care. TE North MOMS Club is a group of local moms who offer support for each other, and do helpful activities in the community. For more info about this group go to http://www.momsclub.org/. For their Spring 2008 activity they offered to help T&E Care! The idea was that when you shopped at specific stores in Paoli on that day either a percentage of the sales went to T&E Care, or T&E Care received gift cards (to give to families in need) directly from the stores. Participating stores included The Blue Tulip, Polka Dots, Chico’s, Julie’s Gold Ribbon, Terra Culture, Van Cleve Collection, Robinson’s Luggage, Paoli Hardware, Talbots, Paoli Nails, and Gentlemen’s Choice. MANY thanks to all those participating businesses, and very special thanks to the community members who went shopping on this day – over $700 was raised!!!!! Wow! LOCAL families will really benefit by your generous help. What a fantastic time had by all those who were able to attend the Panera Bread practice opening on April 5. 2008. Over 200 community members were in attendance. The folks at Panera Bread outdid themselves – the free food just kept coming and coming! The staff clearly got well-trained for their official opening this week. Please stop by and show your appreciation to the Panera Bread staff for giving us such a fun opportunity to thank the community for your continued support. We did take up a collection at the dinner so we could send some money to some of the families whose homes were destroyed last week in the big apartment fire in Malvern. Over $1200 was raised in just 1 1/2 hours. You guys are terrific!!! One final note – remember that Panera Bread will have donation boxes for T&E Care on their counters ALL YEAR LONG. 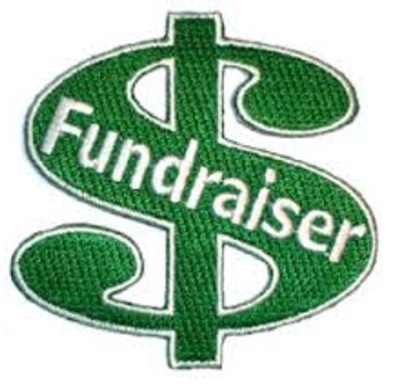 And they will match any donations that come in with 25¢ for each $1.00 donated. Remind your friends about this easy way to increase your donation! Many thanks to 500+ community members who came to the benefit given by the Good Sports held at the Cabrini College Field House on March 15, 2008. The Good Sports are a group of 12 local individuals who hold a party once a year to to benefit some local charities and this year T&E Care was one of the charities! Everyone had lots of fun dancing and eating and just visiting with each other. The funds raised at this event will be used to help local families when some bigger assistance is needed. What a fun way to help a great cause! Thanks Good Sports! Thanks to the local Chesterbrook Allstate agency for sponsoring T&E Care with a generous grant! This type of assistance is especially appreciated as we seek to build some cushion in our funding sources.